The data from Galileo were exciting. While for years the surface of Europa has been known to be dominated by frozen water, Galileo saw that something was mixed in with the water, and, at first, that something was thought to be salts. Not “salt” as in the sodium chloride of your table salt, but more generically “salts” as in “things that dissolve in water and stick around when the water evaporates.” You can imagine why that idea is exciting: if the surface is covered by things-that-dissolve-in-water-and-stick-around-when-the-water-evaporates that strongly implies that Europan ocean water has flowed on the surface, evaporated, and left behind salts. Whatever else is in the ocean is left behind, too. Microbes, fish, whales, you name it, all sitting on the surface waiting to be seen. But there’s more. If the ocean makes it to the surface it probably means, in general, that the ocean and in surface might be in intimate chemical contact. And the surface is rich in energetic molecules (for reasons we’ll discuss below), so that means that energy could be being deposited into the ocean. And if you have water and you have energy? Well, you can guess where this train of thought leaves you. But wait. Further analysis of the spectrum of Europa suggested that an equally good explanation is that – rather than salts – Europa is covered in sulfuric acid. While it sounds strange it is actually perfectly natural. The ices of Europa are constantly bombarded by sulfur which initially came from the volcanoes on Io (ok, this part is sort of strange). In fact, if you look at Europa you can quickly see exactly where the sulfur lands. There is a bullseye of red on the side of Europa that faces the bombardment. Here is the surface of Europa; guess where the sulfur is hitting! Europa. Sulfuric acid must be on the surface. So does that mean there are no salts? No whales? Well, no, not necessarily. The real problem is that with the spectrograph that was on the Galileo spacecraft it was nearly impossible to tell the difference between salts and sulfuric acid. While the two sound very different, they do one thing the same: absorb water. And, once they do absorb water, when you look at the fingerprint of the reflected light with your spectrograph, what you mostly see is that water. There are differences, but you can only detect them if you look at that fingerprint finely. It’s as if you were looking at real fingerprints and you could tell that two were similar because they generally had loops and whorls in the same places, but you didn’t have a good enough view of the finger print to be able to discern all of the individual patterns that would tell you whose hand that finger belonged to. The Galileo spectrograph could tell there was adsorbed water, but it really couldn’t tell who it belonged to, so, in the absence of concrete evidence, most of the discussion of the composition of the surface of Europa has been dominated by what people think should be there, rather than what the inconclusive data show. The consensus view that has settled in is that Europa has both salts and sulfuric acid on its surface. The sulfuric acid is dominant on the half of Europa that is bombarded by sulfur, while the salts dominate elsewhere. And the main types of salts that are thought to dominate the surface of Europa are sulfates. “Sulfate” simply means SO4, so a sulfate salt is something like sodium sulfate – Na2SO4 – or, one that has been mentioned quite frequently for the surface of Europa, magnesium sulfate, MgSO4. Magnesium sulfate sounds like a fairly random chemical for the surface of Europa, but it is not, for two reasons. First, it’s a relatively common and important salt even on the earth. 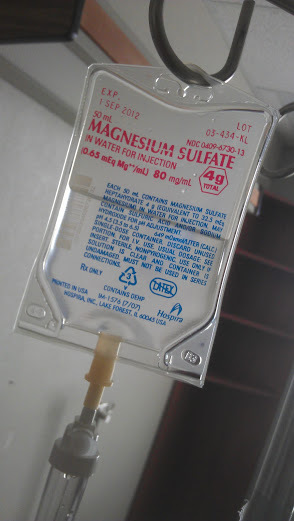 If you are in the hospital and your doctor does a blood test on you and fears you are low on magnesium, you will be given a solution of magnesium sulfate. Second, it is, perhaps something we might expect to find on Europa. Experiments from more than a decade showed that if you take a meteorite – which might represent the types of rocks that the interior of Europa is made out of – and you put it in a pot of hot water for a while and then measure what is in the water when you are all done, one of the things that you are likely to get out of the meteoritic rock is magnesium sulfate. The argument here, though, is a bit circular. Magnesium sulfate is expected, something is seen that can’t quite be identified, it is declared to be magnesium sulfate, and people say -- Look! This is probably true because it agrees with the earlier experiments. It’s all an interesting story, but wouldn’t you like to know what is really going on? I would. While no spacecraft is going to be in the vicinity of Europa for at least a decade, in the thirty years since the Galileo mission was first conceived and designed telescopes on the Earth made advances that were – truly – inconceivable at the time. And while it’s hard to beat flying up close to learn what is going on, we can now see things from the Earth even better than we could from Galileo. It has been clear for a while now that it has been time to head out to a big telescope and figure out what the real story is. Although fascinating, it is quite a complicated notion to be hypothesizing about the chemistry on a Jovian satellite. I am not going to be waiting on the edge of my seat for conclusive evidence of salts or a liquid water ocean, let alone one teaming with life. One thing is certain though, we need ethics hearings and discussions if at any time we suspect that life may exist on a world and what to do once life is confirmed. If whales or other life are swimming around in an ocean beneath Europa's icy (water) crust, we need to respect this treasure and allow the wildlife to thrive, unmolested. There shouldn't be any complex life in the oceans. Complex life requires oxic oceans. On Earth, (a reasonable proxy) our oceans became oxic only after the Great Oxidation Event, and this was only possible with photosynthetic bacteria (cyanobacteria). There is hardly enough 'open' water, let alone enough sunlight reaching through the ice to allow for enough build up of free oxygen in exchange with the water beneath the ice. If there is any life at all, it will be simple and small (ie. bacteria). Is not the solar system at Jupiter and beyond reduced rather than oxidized? Are the Io SO2 and Europan sulfate anomalies? The most important question of all: Will we be able to train the whales to do tricks and pose for photos like the ones at SeaWorld? Thanks, John Morales. I'm kind of an "Enceladus firster" too, but I'm not very radical about it. Fortunately the People decided to raise their taxes. The problem is not the Enceledus firsters nor is it the Europa firsters, but rather it is the combination of record NASA budget cuts and the overwhelming organizational inertia of Mars mission self perpetuation. I should say, however that Mars mission folks are absolutely some of the best, the brightest and they sincerely want to do good science. However we need to ask these guys to please, please help to get life-evaluating probes to Europa AND Enceledus before we are all basically, well... DEAD from old-age. Given the extremely low priority given to plans to send real life-detecting probes to either Europa or Enceldus, we can all take solace that perhaps our children or grandchildren will at least get to be alive when this actually happens. Not that saltwater oceans on moons in our solar system would actually be a compelling reason to said send life-detecting probes. How silly to think that such probes might actually be the most import important space science mission of all time. Lets just keep ignoring these and keep doing other "more important" stuff. ESA is not much better. The European Space Agency is somehow excited about its newly approved "JUICE" mission, that will put a satellite probe around a few of Jupiters icy moons by, get this, 2028. Nothing on the surface of any of these moons, of course. Instead the sattelite will just further evaluate the general potential for life at a distance, putting any real prospect of landing where the definitive evidence is well into the 2030s. This seems woefully short sighted. There are times when boldness and risk-taking are required in the pursuit of great science. Instead we see ESA and NASA frittering away one of the greatest potential scientific inquiries of our lifetime, burying and deferring decisive action for decades. I love smoothies and this one looks so yummy!